Can you pass this one button IQ test on facebook? I’m trying an experiment – if you can see this image on facebook, please press like. I’m trying to figure out what the importance of a facebook like does to the google result for a particular page. 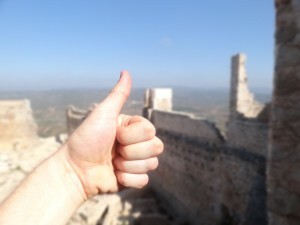 OK, so I know that the photo was taken at Xivert Castle in Spain, but it is my thumb and it is about a trip I just take. Well, the details of the trip come later if I can get more than 20 likes.